Editor’s Note: This biweekly column is sponsored by Dominion Wine and Beer (107 Rowell Court, Falls Church). It is written by Arash Tafakor. Rosé is huge in the states. I don’t need to tell readers that. Most social gatherings, rosé is as common as a local craft beer. And why not? rosés are super drinkable, bone dry, with little to no sweetness, and can pair with any food you can imagine. I literally had one with a PB&J sandwich the other day, and it was life changing. The good news is rosé is here to stay and there’s a second wave of rosés coming into the market. The past few years it feels like every winery in the world is now producing a rosé. Apothic, Kendall Jackson, rosé in boxes and even 40-ounce bottle rosés! You should find a bigger and better rosé section at any wine store. With the flooding of rosés in the market, consumers have gotten more discerning when it comes to quality. Wineries have stepped up their rosé game and started producing enough to make them available year-round so they don’t get lost in the shuffle. This is great news for wine drinkers, quality and quantity of producers. Even though there’s been amazing rosés being produced for years, one trend that is starting to gain traction in the main stream is to sit on these delicious wines for a few years as opposed to just drinking the most current vintage. A well-made rosé can last several years after it was bottled and will certainly get better with age. 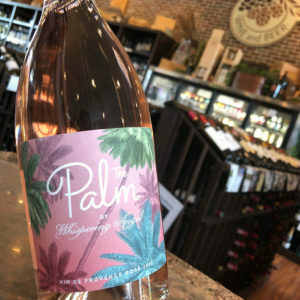 An example of a winery producing a new rosé that is high in quality is the “The Palm” Rosé by Whispering Angel 2017 from Provence, France. Whispering Angel, which is one of the best-selling rosés in the world, decided to make a second label. “The Palm” is actually cheaper and quite honestly just as good if not better than its more expensive counterpart. Don’t take my word for it, my friend Hoppy buys a case of it every few weeks. I told her to sit on a case for the next year or two, but that seems impossible. Another trend in wine that is gaining a lot of traction is wine in a can. Like most consumers I was hesitant/skeptical about drinking wine from a can. This comes from a bias that wine out of a can is of low quality, and to be honest, when canned wines first came out a few years ago they tasted like crap. Like bad beers in cans such as Iron City out of Pittsburgh, there are bad wines in cans. There’s also bad wines in glass bottles. The vessel itself is no different than any other, it’s the quality of liquid inside that matters. The good news is there’s a resurgence in canned wines, partially driven by the craft beer industry that is mostly canning their beer now. Cans obviously have ecological benefits, they’re fully recyclable and most importantly, convenient. Wine producers that have decided to can understand these benefits and are putting higher quality wines into cans. Since cans are airtight, aging is not beneficial so most of these wines are made to be crisp, clean, bright and drinkable, which makes it a perfect vessel for… rosé! 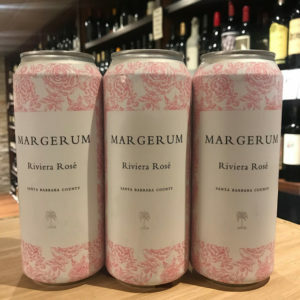 A great example of a delicious rosé in a can is the Margerum 2017 Riviera Rosé from Santa Barbara, California. This southern California born rosé mixes sophistication, quality and partying. I have no shame bringing a 4-pack of this rosé to any party sipping them straight out of the can. Please drink responsibly and come by Dominion Wine and Beer and check out our rosé section.